How Far is Riddhis Grandeur? Riddhis Grandeur, located in Hyderabad, is a residential development of Riddhi Builders. It offers spacious and skillfully designed 2BHK and 3BHK apartments. The project is well equipped with all the basic amenities to facilitate the needs of the residents. The site is in close proximity to various civic utilities. Riddhi Builders & Developers is a very renowned real estate development company in Hyderabad. The group has been serving its clients with magnificent marvels and luxurious residential spaces. Their commitment towards top-notch quality and service has earned them a strong and long-lasting relationship with their clients. Their credibility in this field is evident from the number of successful projects handled by them in the past decades. 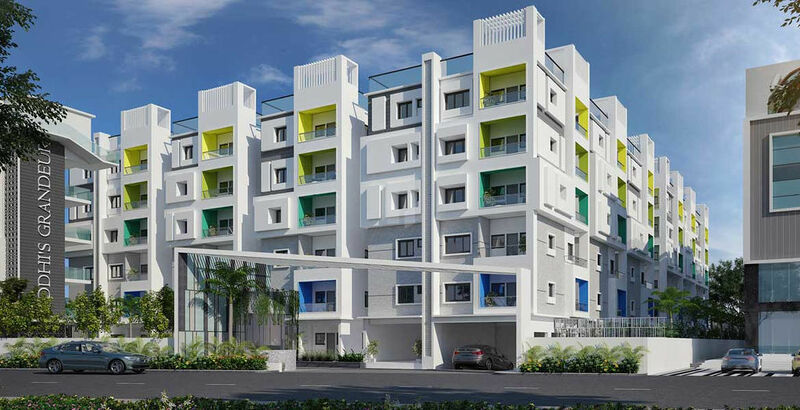 Their developments include Riddhi’s Lake View in Manikonda which offers you ready to occupy 3BHK apartments for sale in Hyderabad and Riddhi’s Saphire in Nanakramguda which serves you 2BHK & 3BHK apartments as well as Riddhi’s Valentino in Kondapur which offers you 2BHK & 3BHK apartments for sale in Kondapur, Hyderabad. They are renowned for superiority in the fields of quality constructions and locations. Their constant endeavors are aimed at providing the best quality living to all strata of the society without any compromise on quality. In addition to high flying constructions for the elite, we are also into the construction of affordable and visually charming homes complete with all conveniences.